KY3 Political Notebook: What Are We Worth To You? What Are We Worth To You? 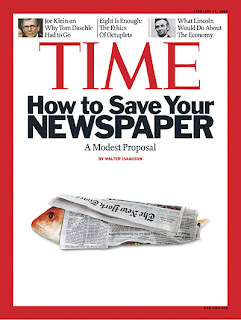 Having just polished off this week's TIME cover story on a proposal to keep newspapers and media organizations financially solvent, I felt compelled to pose this question to The Notebook readership: What are we worth to you? We, meaning, the political press corps of Missouri. Or on a broader level: Any type of journalism you consume during the day online. If a price tag was placed on the journalism you consume, would you pay for it --- or bypass it? It's not news that the economic downturn is taking a harsh toll on the journalism profession. After the Kansas City Star went through layoffs last fall, the St. Louis Post-Dispatch and Springfield News-Leader soon followed suit this year. Newspapers have been hardest hit. But the television industry is also fighting to tread water in a rough tide. Even at market-dominate KY3, slumping advertising sales has meant the consolidation of job duties, doing more with less and a stationwide search for revenue enhancers. In this week's cover story, former TIME managing editor Walter Isaacson offers what he calls a bold, but old idea: Charging for online content. "We have a world in which phone companies have accustomed kids to paying up to 20 cents when they send a text message but it seems technologically and psychologically impossible to get people to pay 10 cents for a magazine, newspaper of newscast," writes Isaacson. At first glance, you may think: Blasphemy! This nation was built on the foundation of a free press, and I expect my press to be free of cost! Especially online! But Isaacson writes: "Those who believe that all content should be free should reflect on who will open bureaus in Baghdad or be able to fly off as freelancers to report in Rwanda under such a system." Isaacson's proposal is modest: Charge for articles online like Itunes charges for songs. Maybe it's 99 cents. Maybe it's a dime. Make it easy, point and click. Make it cheap. A micropayment. No waiting. So you can get right to the content. Each media outlet would carve out their own way of doing it. Maybe the Post-Dispatch charges 3 bucks a month to read Tony Messenger, Virginia Young and Jake Wagman each day. Maybe the News-Leader charges you a fifteen cents to read Chad Livengood's Sunday piece. Maybe KY3.com requires a dime for you to click and watch our latest Truthwatch report on a campaign ad. Watch 10, get the next one free! Maybe most of the content is free, and exclusives and special reports (with a brief tease to lure you in) get a price tag. Would you do it? Or would you decide it's not worth your money. Part of the KC Buzz blog's problem may have been that they went in alone. Political consumers thought, heck, I'll go elsewhere to get my daily fix. But what if everyone moved to this micropayment system. Would we lose readers/viewers in the process and shut out those not in the elite --- or would we build a more valued following? It's a question that's as scary as it is prescient. Isaacson concludes that if media outlets implemented the micropayment system for online content, some surfers would inevitably balk. But he thinks that over time, the best journalists would not only survive, but thrive. And he offers some evidence that some people will pay for top-shelf journalism, even in a gloomy economic environment. In rough-and-tumble 2008, paid subscriptions to the Wall Street Journal were up 7 percent. I still believe buying the newpaper is the best bargain in all the world. All that information for 25, 50 cents, or a dollar? There is no better buy. But even this newspaper lover doesn't have any paper subscriptions anymore (though I do have several magazine subscriptions). I'd feel foolish paying for it, when I wasn't forced to. The problem for the news providers is that they have been built on advertising revenue and now that viewership or readership has declined they can't live their rah-rah lifestyle. Many readers have been turned off by the cozy relationship between the press and the people they cover. If I don't like the editoral position of a news provider(news-leader) why support them? I saw the article's author make the pitch on The Daily Show last week. I'm not sure how media content producers will establish a fee structure, but I think that media may be well served by the trend being established in the non-profit world, line item sponsorships. If I were to pay $20 a month for, say, 100 news story credits, as a consumer I would feel that by my spending, I'm specifically supporting the type of reporting I want. People currently pay fees for access to scientific, medical, and law journals. They pay because the knowledge within the articles have, evidently, an established market value. Ultimately, consumers want control and in a world full of noise, we will be willing to spend money to save time. I wouldn't pay...not for online content. I don't see any difference in watching the news on tv or reading it online, but it's the newspapers that put their content online so anyone can read it for free. So yeah, I will read it. It wasn't all that long ago that we didn't have all this information available online. If a company gains revenue from people buying their newspapers or watching their broadcasts, then quit putting that same information online for free and I'll go back to watching it on tv or buying a paper/magazine. Sandy is of course wrong in her pleas to turn back the clocks but refreshingly honest in her unwillingness to pay. 1. Fee-based services like those described here, where those who are available and willing to pay will have access to some sort of premium content beyond that of regular users. 2. Ethically questionable advertising spots, such as what you see on some radio shows and television right now. More incorporation of advertising messages into actual news stories. I'd like to think this would just stick to entertainment, but at the rate things are going I do not believe news is immune. The problem, as I see it, is two fold. First the user must want the content - and to be blunt - I refuse to read with any regularity many publications like TIME magazine which are nothing more than sock puppets for the extreme left wing. That is fine, they certainly have that right and if they can make money at it, more power to them. In the mean time, though, dont cry to me about not meeting your quarterly projections when you through roughly have the country underneath the buss and call them names. The second issue, especially with internet publications, is establishing an acceptable metric. In my experience there are advertisers who dont necessarily want to pay what a media outlet deems as its value for its exposure(s). For web its worse in that some clients look at a cost per click or products bought instead of exposures. This conflict leads people to want to do subscription based content. Business managers believe that surely people will pay for that sort of information. Of course the past decade proves other wise. To be honest, I am not sure if web content is something that will ever be profitable based on today's business models. Its all a hodge podge of concepts with few constistent winners. Of course, as I stated above, maybe some of the same news outlets (you included Dave) should think twice before editorializing and slanting their product and selling it as hard news. Why would I want to pay for something like that?